in Erie for his parents. Alex was an adventurous man who spent the last half of his life in several cities in Colorado—Aspen, Leadville and Cripple Creek. In 1886, while living in Aspen, Colorado, he and his younger brother, Frank, joined a group of volunteers to fight the Ute Indians near Meeker, Colorado. The "war" appeared to be a fiasco and when they arrived, their services were not needed. He accidentally died attempting to repair a broken water pump in a mine in Cripple Creek. His son, Charley, was there to help and discovered his father's hat as he searched for him when he failed to return from the mine shaft. Alex Bliley, a well-known business man and contractor, was drowned at 6:30 o’clock this morning in seven feet of water in the shaft of the Cripple Creek Mining company, corner of Fourth and Myers avenue. Mr. Bliley and his son Charles, 20 years of age, had descended to the water level of the mine. Mr. Bliley had a contract with the company to pump the water from the shaft and had installed his pumps about ten days ago. Mr. Bliley was attending to some matters at the station while his son had gone up the ladder to get something. The pumps had been started and [with] the noise did [could] not warn the son when the father slipped and fell into the water. When Charley Bliley came down the ladder scarcely a minute or two after going up he saw his father’s had floating in the water. He at once gave the alarm, the whistle was sounded and J.S. Walker and Willard Wyatt went to the bottom and with an iron hook seven feet long grappled the body and brought it to the surface of the water. It was all the two men could do to get the body into the bucket. Mr. Bliley had on heavy canvass boots filled with water and his clothing became to heavy that he was unable to extracte himself. The body was hoisted to the surface and Coroner Gesell notified. The remains were taken to the undertaking parlors of Hopkins & Gesell. 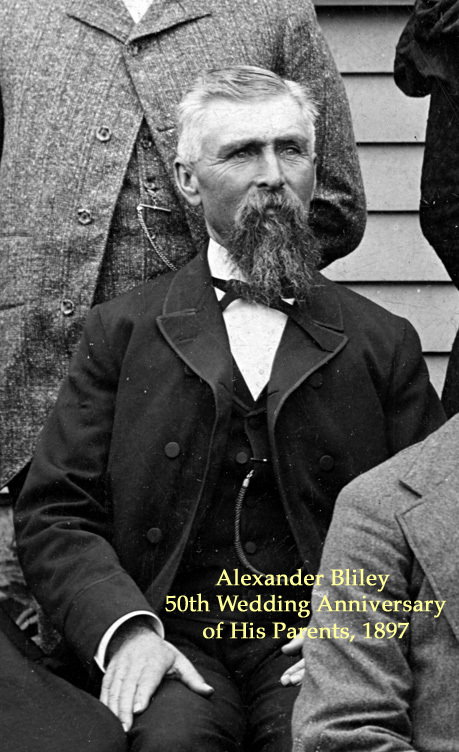 Alex Bliley was about 50 years of age and leaves a wife and two sons, Charley, 20 years of age, and Harry, 8 years old. The family resides at 100 Main Street, Old Town. Mr. Bliley came here about ten years ago from Aspen, but originally hailed from Pennsylvania. He has been in the second-hand mining machinery business for years at 408 East Myers avenue. Mr. Bliley has been a member of the A.F. and A.M. and was highly respected and industrious citizen. No arrangements will be made for the funeral until relatives can be heard from in Erie, Pa. Coroner Gesell stated this morning that he did not believe an inquest would be necessary. 1905 Newspaper Article Transcription. 0.2 Mb. 1890 Newspaper Article on the Ute Indian War of 1887—Extract of newspaper article of Ute "war" of 1887 in which Alex (39) and his younger brother, Frank (22). They did not see an action, but were at the ready in Meeker, Colorado, the command and mustering center. 5.5 Mb. 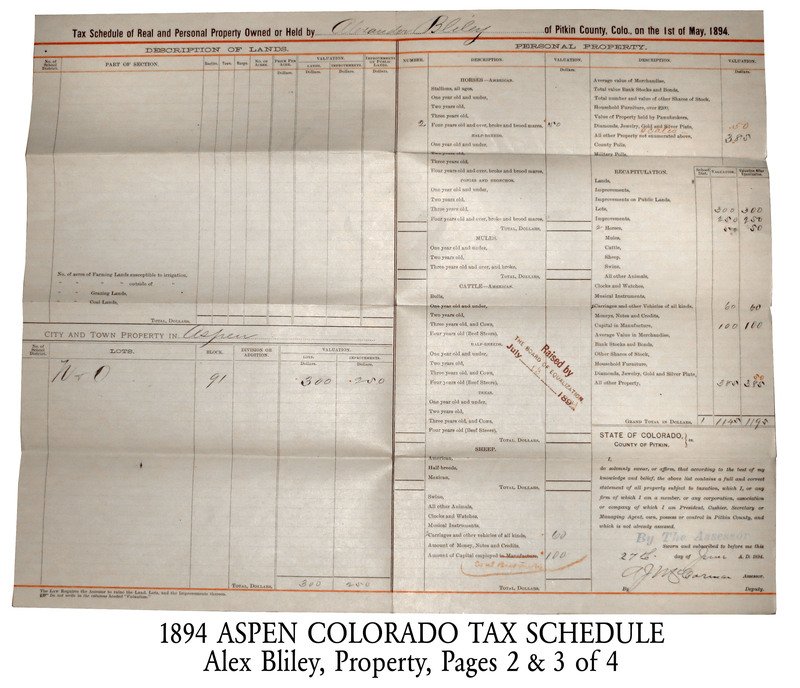 1894 Aspen Tax Record—This file was discovered during a visit by Charles Bliley to the Aspen Historical Society archives on September 25, 2014. 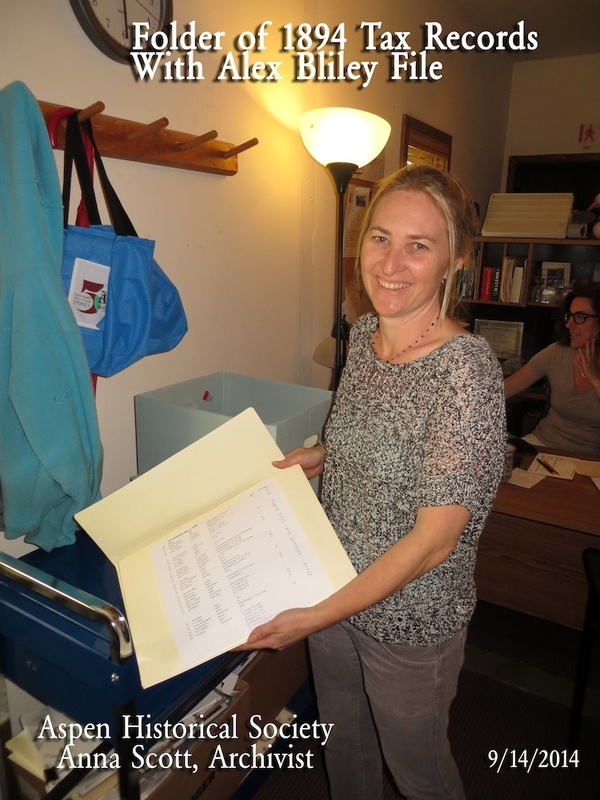 Archivist, Anna Scott, had just received this file, among others, a few days prior to my visit. 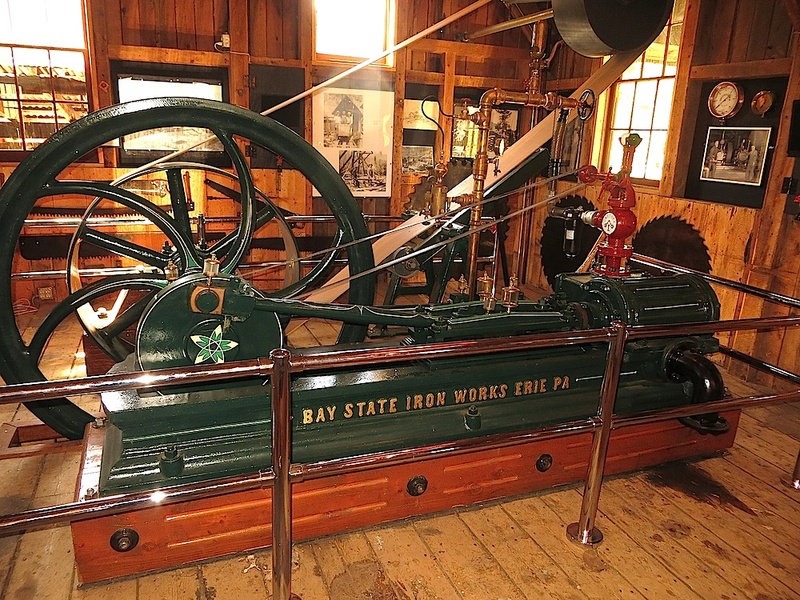 Bay State Iron Works, Erie, PA Steam Engine—"Discovered" in mining museum in Aspen, Colorado September 19, 2014. 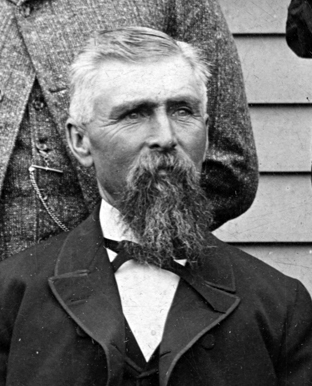 Alex had a mining equipment and building material company in Aspen and was the superintendent for the initial exploration dig of the Bay State Mine of Aspen, developed by the Bay State Mining Company of Boston, Massachusetts. Alex was born and raised in Erie, and could have worked for the manufacturing company and a sister division gave him a job? Could there be a connection? Hopefully, more time and research will tell. Drowning in Cripple Creek, Colorado, August 25, 1905—Alex died in a mine in Cripple Creek as he attempted to repair a sump pump with his son, Charley, at the top of the shaft waiting for his return. 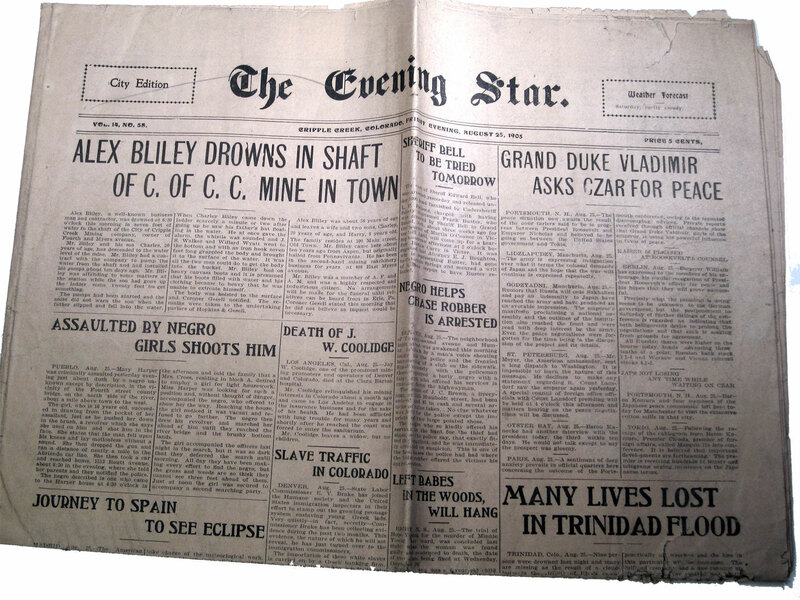 Here is the article published the very day he drown in the Cripple Creek "The Evening Star". 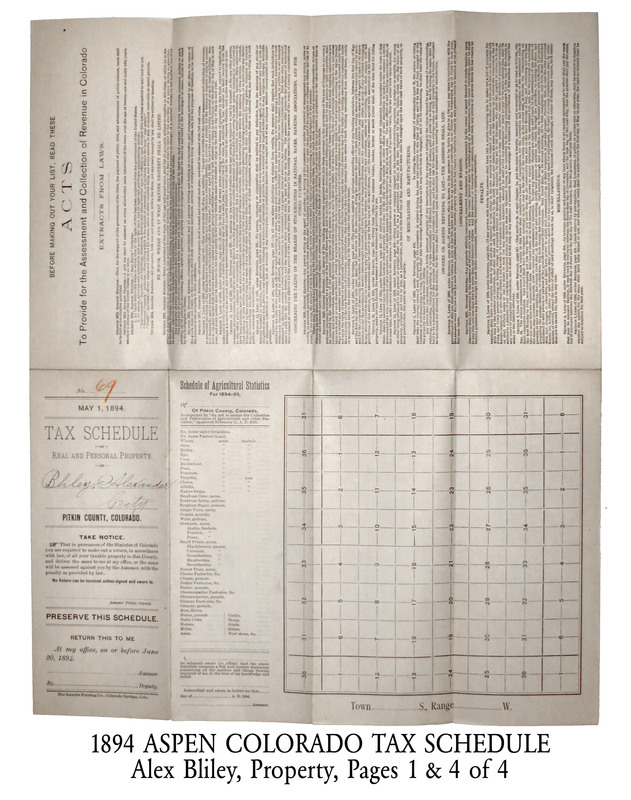 This newspaper was found in 2010 in the Bliley Archives in Boulder, Colorado among the materials saved by Frank A. Bliley, his brother.